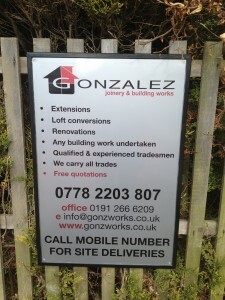 For all your Carpentry, Joinery and General building needs, Gonzworks are at hand to offer you top quality services at competitive prices. Professional and reliable, we offer all our domestic and commercial customers unlimited amounts of superior craftsmanship. Are you thinking of buying a second hand property? It might be structurally sound but not to your taste, even if that means a full refurbishment. We can help you to rewire your property, install a new heating system, add a garage or extension or maybe a loft conversion is what you were thinking. We can help make your house a home, before or after you move in. Fitting of doors, frames or mouldings even a staircase if needs be. We can supply and fit a new kitchen or bathroom with all the trimmings. Don’t worry about plastering those walls or tiling we can take care of that as well. We can help you with those rotten floor joists or even repair your roof including any structural work that maybe required. We supply and fit a full range of UPVC from gutters to conservatories. Nothing is a chore to us. We are fully trained and more than capable of project managing any task you have in mind. I don’t expect you to take my word for it, I’d rather let our work do the talking.